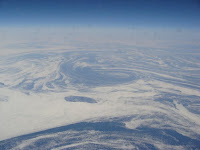 I've never quite grown out of the childish joy I get from seeing the earth from an aeroplane. It's particularly enjoyable if you recognise the places you fly over, of course, but this view of the sea ice off the coast of Labrador and Newfoundland really took my breath away on Sunday. Flying towards Heathrow last week was great too, as it was clear over the western half of the UK and there were great views of southern Ireland, south Wales and the M4 corridor. The contrast between the UK and Canada from the air is quite striking. The UK has small patches of wilderness surrounded by carefully tended fields, while in Canada it is the other way about. 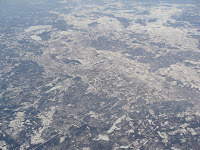 It probably is hard to see, but this photo is of a patch of farmland, north of Ottawa, surrounded by more rugged countryside. Nancy - thanks for the welcome. Yes, we're in Ontario - and absolutely loving it here! Sue - how mean! In this age of Google Earth it seems a bit strange to stop people taking photos on planes. Sounds like you just got a grumpy stewardess that day.